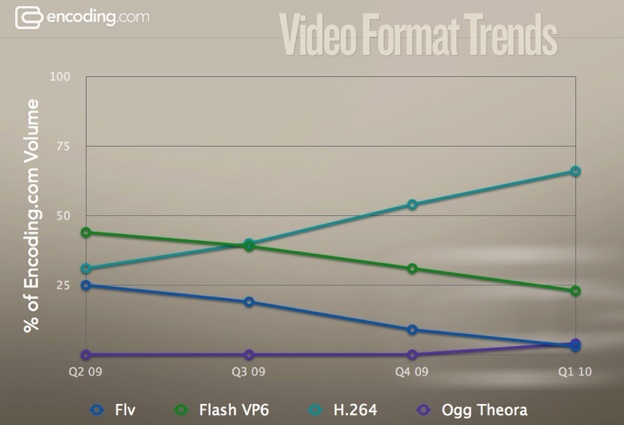 Earlier this week, Steve Jobs kicked the debate about the need for Flash into high gear, especially for Web video. As he explained, Apple products like the iPhone and iPad don’t support Flash because although 75 percent of video on the Web is in Flash ” almost all this video is also available in a more modern format, H.264, and viewable on iPhones, iPods and iPads.” The next day, Microsoft weighed in, saying that Internet Explorer 9 would only support the H.264 codec for HTML video. Another data point that Steve Jobs mentions: All YouTube videos are available in H.264, which alone represents 40 percent of all videos on the Web. So these numbers from Encoding don’t seem so crazy. The formats can be confusing between containers and codecs. FLV is the Flash container with the old H.263 codec. Flash VP6 is the Flash container with the VP6 codec. H.264 is a codec that is utilized in a number of different containers (.FLV, .MP4, .MOV) and on Apple mobile devices and when deployed by browsers for HTML5. Microsoft just announced that IE will use H.264 as the default codec for HTML5. And, Google will be soon offering the VP8 codec as open source which will add another formidable flag in the format wars.